It was my first time at a book fair and I was entirely unprepared for what I saw. 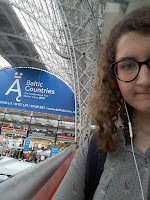 I doubt there was another place in the world between the 10th and 12th April other than Olympia in London that was as full of people walking with books, talking about books, and selling books. Every time a badge would come into my vicinity, I could see ‘writer’, ‘bookseller’, ‘publisher’, or ‘student’, in other words, people whose lives generally revolve around books and their production. It was overwhelming and exciting at the same time. Something similar could be said about the seminars. The choice was incredibly diverse and answering to any tastes. Over the span of three days, I visited 12 seminars, and it still seems like a tip of the iceberg. One of the highlights was #MeToo: Passion, Politics & Poetry: The Power of the Collective, their open discussion about the importance of awareness and support when it comes to sexual abuse victims was very inspiring. The idea to integrate poem-readings into the discussion was brilliant and added the sense of immediacy and unity to the event, I got the instant urge to read that poetry collection from cover to cover. Next one has to be The Tension Between Universality and Diversity: A Reading and Audience Discussion with Author Selina Siak Chin Yoke The author gave a brilliant talk and managed to touch on the important social issues when it comes to diversity, as well as make it funny and entertaining. The talk prompted me to read the book, the signed bunch of which, luckily, Selina Siak Chin Yoke was giving away at the end of the seminar together with a piece of Malaysian traditional cake (Putri Salat)! As a Poetry Matters Project’s intern, I was looking forward to Poet of the Fair: Imtiaz Dharker in conversation with Jen Campbell and was in no way disappointed. The interview was open, honest, and insightful for both, writers and editors alike. Imtiaz shared her impressions on modern poetry and the ways in which she sees poetry, “poetry is something that is in everyday life” for her. Alex O'Connell were especially interesting. Overall, the stands were overflowing with people and coffee cups, but no one seemed to mind. Every space was open, so the background of shouting and laughing was an inseparable part of the experience. 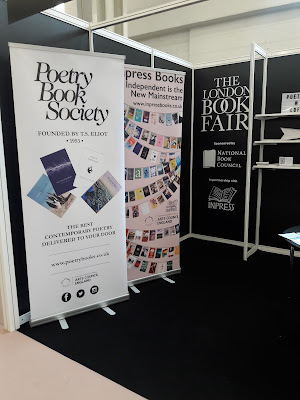 It was the London Book Fair, so being surrounded by words seemed like an appropriate setting. After visiting such an event, I am determined to find out more about international book fairs and attend them as often as possible, it was an invaluable experience for me! Bells and Whistles 2018,McCormick S.C.